After two days of a painful sore throat, sniffly nose, major congestion & off/on headaches, I finally went to urgent care & I have the flu, supposedly the type that the flu shot doesn't protect against. At least I have medicine now & am on my way to feeling better! 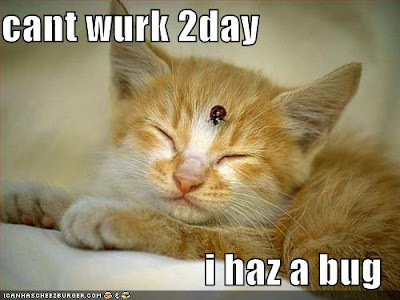 LOL, I haz a bug! Feel better babe! Take medication to recover from the illness right away.